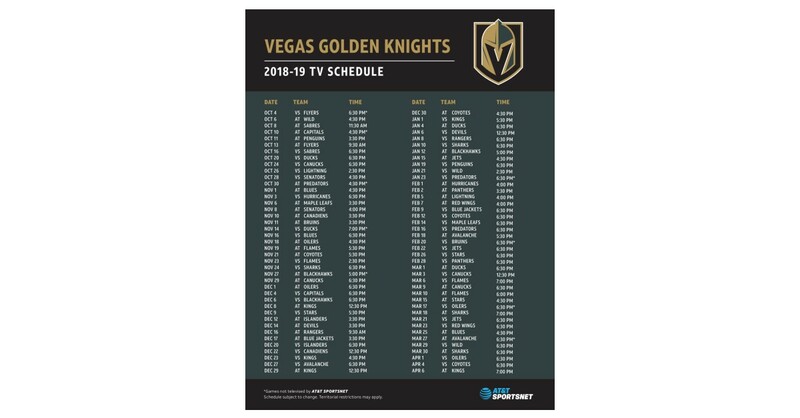 LAS VEGAS–(BUSINESS WIRE)–AT&T SportsNet, the TV home of the Vegas Golden Knights regional game telecasts, announced today they have come to an agreement for DISH to carry Vegas Golden Knights live regular season games, pre- and post-game shows and other ancillary programming in Nevada, as well as parts of California and Mohave County, Arizona. The regional sports network will become available to subscribers in those areas beginning October 6, 2018. These Vegas Golden Knights regular season games, pre- and post-game shows and other ancillary programming will also be coming to existing DISH customers in Utah who subscribe to AT&T SportsNet. AT&T SportsNet™ is the television home of the Colorado Rockies, Utah Jazz, Vegas Golden Knights and Mountain West Conference. The network delivers more than 350 live events each year across eleven states – all of which are available in high definition. AT&T SportsNet is owned and operated by AT&T Sports Networks, which operates regional sports networks in the Pittsburgh, Rocky Mountain and Southwest regions. The three networks combined reach across 21 states and hold exclusive rights to produce and distribute live events from more than 15 teams and conferences. Territorial restrictions and blackouts apply.